I have had some pretty bad experiences with non-stick pans. The last set I purchased didn't stay non-stick for long. Within 3 months everything was sticking to the pan. So I was very excited when I got the opportunity to try out Circulon's Prime Cookware. Circulon is new to Canada and is launching their Prime Collection Fall 2014. What differentiates Circulon is their patented system which features a series of raised non-stick circles on the surface of the pan. This reduces the amount of non-stick surface that comes in contact with utensils, minimizing surface abrasion and maximizing durability. 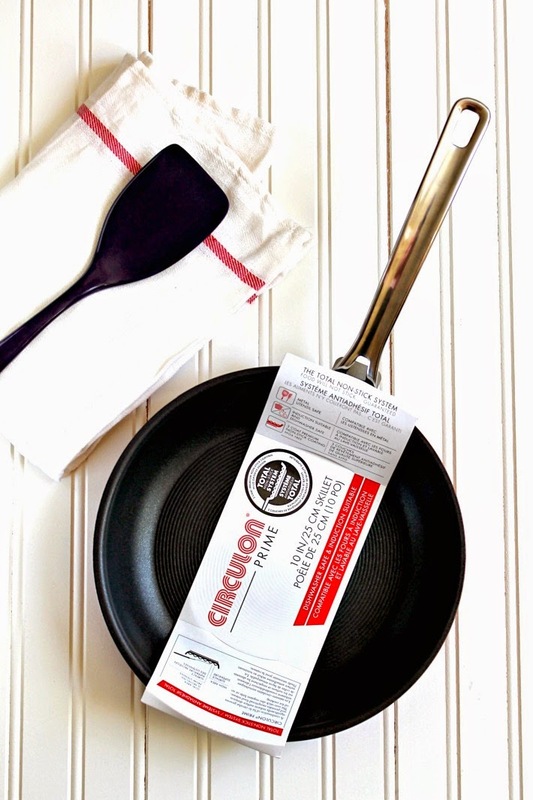 Today I will be sharing my experience testing out Circulon's 10 inch non-stick skillet. I have been testing out this non-stick pan for a couple of weeks. I started out frying an egg. I love my eggs over easy but have always had such a hard time flipping the eggs intact. With just a little bit of oil, I was able to easily fry an over easy egg. I've also used it to make Bilal a grilled cheese sandwich which turned out perfect. It worked great to fry up some okra and corn without a lot of oil! I also used the pan to make pancakes. I only needed to lightly grease the pan at the beginning. The pancakes cooked up great although the circular pattern on the bottom of the pan created a circular pattern on the pancakes. I found when using this pan for an extended amount of time, the handle heats up so be careful when using. This is not a defect as the website states that if you use the pan for extended amounts of time, the handle will heat up. For something quick like frying an egg I had no problem with the handle heating up. Circulon is metal utensil safe so I made sure to test it out with my metal spatula while frying up some kebobs. Since the non-stick works so well in the frying pan, I found my metal spatula slid underneath very easily and left no marks on my pan. With extended use you may get some superficial marks but Circulon says that it will not affect the performance of the non-stick. I was amazed at how little oil I used when frying kebobs. Before starting I put a little bit of oil and after that I didn't need to add any more. I fried around 15 kebobs in batches of 3. 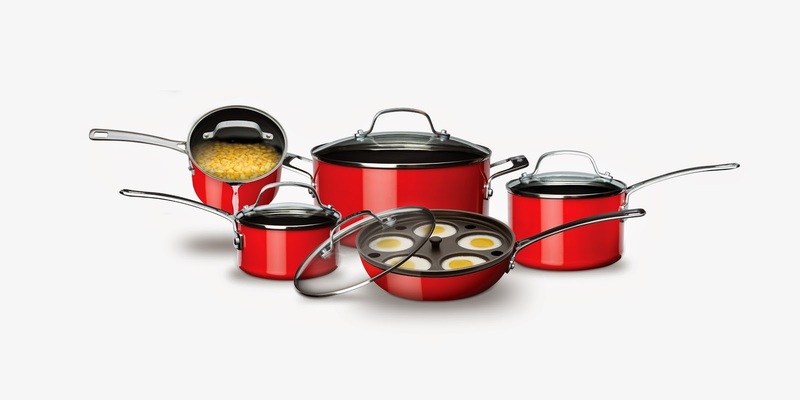 I loved the red colour and the design of this pan. I found I used a lot less oil when frying. Circulon has been making non-stick pans since 1985. Their Prime Collection can be found at Canadian Tire. Circulon is having a contest from September 15-November 16, 2014 where they are giving away weekly prizes from the Circulon Prime Collection ranging from a pair of skillets to a full cookware set and a grand prize of a Foodie Getaway to Montreal. To enter click here. Disclosure: I received a free sample to review. All opinions are my own.